Have you ever had customers who thought that good customer service was affection - who thought that for some reason, you were only nice to them and not the 200 other people you encountered that day? I wonder if it is that way with the "But I'm Good With Dogs" people. If your dog is friendly and outgoing, you might not know what I'm talking about. But if you live with a shy, fearful or reactive dog, you have some experience with this -- you tell a stranger, no you can't pet my dog. The intrusive person's response is "But I'm Good With Dogs." or "All Dogs Love Me." Are you one of those pet parents who doesn't want to converse with strangers when you are out with your dogs? Work on your reflexes. Say "no thank you" and immediately walk away. Do not wait for a response. How do you deal with intrusive people? Are you an intrusive person? Tell us about it in the comments below. I've found that if I just wear my SWAT shirt (http://www.armysurplusworld.com/custom/photos/swattshirt.jpg), other dogs will avoid me for some reason. Thank you for addressing our plight. Those in my line of work get paid handsomely to pretend to like annoying people - it's incredible that they think we really care about them. I just tell people before they approach that my terrier has canine hirsutism and they leave us alone. My "pet" peeve is that we train our dogs to walk on our left side, but all public paths require us to walk on the right. This means that a) the dog is on our left in the middle of the path where bikers, runners, skateboarders, etc, pass by (usually fast and unannounced), b) the dog can't sniff the earth on the right side of the path, and c) if we pass another person with a dog, we must pass dog-to-dog - not good. The only alternative I can think of is to train our dogs to walk on the right side, or at least to be able to "switch" to the right side. If I dress in my holy clothes, 2-day beard, and zombie look, people will usually avoid me (if they don't, I surely have to avoid them). Another option is to do the morning walks in jammies (with the padded feet) - people will usually cross the street to avoid me then. 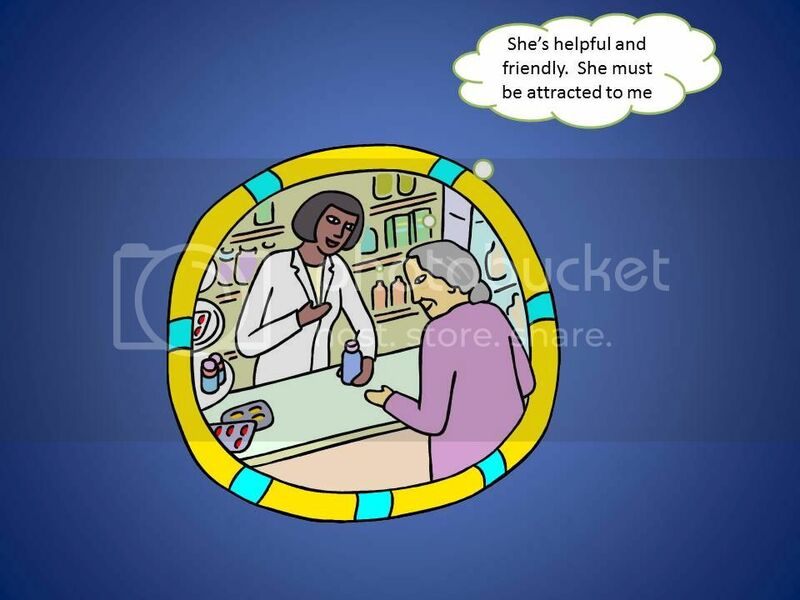 My 50-something pot-bellied cousin (we'll call him "Mike") thinks every 22-year old grocery checkout girl has a thing for him. I'm like, "Mike - she's just doing her job." He thinks it's more than that ("she wants my number, I'm telling ya"). I just say, "Dude, whatever, get your Prep H and let's get out of here - we're going to be late for the Luby's early bird special."